ON Wednesday the government raised the foreign direct investment (FDI) limit in the domestic airlines from 40 to 49 per cent. The UPA government’s Budget had promised more FDI in insurance, telecom and civil aviation. The Leftist leaders had opposed the proposal openly. THE government’s decision to finally delete onion from the Essential Commodities Act will enable its free trading without any restrictions on the quantity to be stored by a farmer or a trader. The farmers will thus get remunerative prices and the consumers, better supply. IF India and America were to enter the track marked corruption and start running in opposite directions, guess who would win the race. Remember the race is being run on the principle of “by hook or by crook” enunciated by the West when it was wild. Why not learn from the armed forces? EVER since Dr Manmohan Singh’s government took charge, it has focused attention on good governance. A dedicated and dynamic bureaucracy, sensitive to the changing times, is all that is essentially required for good governance. But that has not been the case. The bureaucracy has not been able to remodel itself in consonance with the people-friendly environment of post-Independence democratic India. RAM Lila is here again. These days children do not know much about the performance and enjoyment of Ram Lila. We sure have discourses, bhajans and kirtans. In some places the performance of Ram Lila is there but the parents are too busy and they do not think that the kids may enjoy it. So they do not take them there. MR O.P. Sabharwal’s book “India’s Tryst with Atom” is a very valuable contribution to understanding the country’s nuclear development policy. The book deals comprehensively not only with the Indian nuclear weapons programme, but also the Indian reactor programmes, including the ones which are under development. THE world-famous concrete monument, Bhakra Dam, is a prized possession of India. It is a reservoir of prizes and surprises. The Bhakra Dam, standing 740 ft from its foundation, is the highest dam in Asia and the second largest in the world. Its height casts a magical spell on one and all as it rises three times the height of Qutab Minar. ON Wednesday the government raised the foreign direct investment (FDI) limit in the domestic airlines from 40 to 49 per cent. The UPA government’s Budget had promised more FDI in insurance, telecom and civil aviation. The Leftist leaders had opposed the proposal openly. Why have they now accepted the FDI hike in private carriers? Because management and operational control of private airlines will stay in Indian hands. The Left’s pressure has diluted the Finance Ministry’s initial proposal to let foreign airlines invest in Indian private carriers. This is what some domestic airlines were expecting. Their disappointment is understandable. The government decision is welcome on paper since it will help the private airlines raise cheap equity. Also, automatic clearance for aviation FDI will avoid delays. The airlines is definitely a capital-intensive industry. Domestic airlines can now offload up to 49 per cent of their equity to raise funds. But this is also a highly competitive, risky sector with unreliable profits. Private investors will think twice before parking their surplus funds in this volatile sector. When 40 per cent foreign investment was permitted in the Indian private airlines some 18 months back, there was enthusiasm. But no one has come forward with investment. Now when the FDI limit has been raised to 49 per cent, what difference does it make? The government is obviously not keen to open the door fully to foreign carriers. “Allowing foreign carriers to invest in domestic airlines will not lead to any value addition for the domestic carriers in terms of their operations or management expertise”, avers Civil Aviation Minister Praful Patel. Whether the domestic airlines are able to raise cheap funds remains to be seen, their competitiveness, in the meantime, will definitely suffer. The proposal to privatise airports remains shelved. The travelling public, it seems, will have to wait for more time for better facilities and, cheaper and better services. THE government’s decision to finally delete onion from the Essential Commodities Act will enable its free trading without any restrictions on the quantity to be stored by a farmer or a trader. The farmers will thus get remunerative prices and the consumers, better supply. Onion has seasoned Indian politics for long. In 1980, Indira Gandhi rode to power articulating the general public’s anger over the rising prices of the lowly pyaaz. Nine years later, the bulb put the BJP on the ascendancy as mush as the temple campaign. But in a reversal of fortune in 1998, the BJP lost the elections in four states when the prices of onions skyrocketed. It banned exports and included onions in the list of essential commodities. It is such an integral part of Indian cooking that any increase in its price brings tears to millions of eyes. That is why ruling as well as opposition parties keep a hawk’s eye on its availability in the market. There has been a flip side to this hyperactivity. All sorts of restrictions were placed not only on its export but also on its movement within the country. The idea was that nobody should hoard it to cause artificial scarcity and jack up prices. The new decision is in keeping with the present-day reality. The excessive restrictions were a case of being once bitten twice shy. The prices had risen even earlier not because of hoarding but the destruction of crops and ineffectual distribution of the depleted stock. Hoarding only followed this scarcity. What jittery politicians fail to appreciate is that onion is not a produce which can be easily hoarded unless there is a major bungling in its supply. Acute shortage of onions has been followed by distress sales also, wiping out many farmers. Ironically, the government did not declare a support price even when there was a glut in the market. Such cyclical rise and fall can only be controlled through a sensible distribution network. IF India and America were to enter the track marked corruption and start running in opposite directions, guess who would win the race. Remember the race is being run on the principle of “by hook or by crook” enunciated by the West when it was wild. India would beat the mightiest nation on this planet by a good two-point difference. According to the latest report compiled by Transparency International, America is 18 points below the cleanest nation. India has only to walk past 16 nations to claim the crown of being the most corrupt. Of course, such a victory would be as dubious as the one that saw Dubya enter the White House four years ago. In any case, the convoluted calculation that has been used by Transparency International to separate the grain from the chaff should not have been applied blindly. Is it not a fact that within SAARC India would hold out a ray of hope to the less fortunate countries like Nepal, Pakistan, Sri Lanka, Bhutan and Bangladesh? By being where it is on the global scale India has helped improve the “comfort level” of the less privileged nations by remaining in their dubious company. Let the moral brigade do the breast beating in seclusion. In any race only the first three receive medals. The rest simply make up the field. Finland, Iceland and Denmark have grabbed the top three spots in the list of clean nations. Placed at low at the 90th position, India at least has Russia for company. Moving up might prove to be a personal “bank breaking exercise” for many. Had Harshad Mehta not been found out and the vigilance agencies tightened their vigil around the banks and the bourses India might have beaten Bangladesh in the race to the bottom of the pit. EVER since Dr Manmohan Singh’s government took charge, it has focused attention on good governance. A dedicated and dynamic bureaucracy, sensitive to the changing times, is all that is essentially required for good governance. But that has not been the case. The bureaucracy has not been able to remodel itself in consonance with the people-friendly environment of post-Independence democratic India. It continues to be aloof, uppish and overbearing as it was in the days of the Raj. What is even worse, it has become indecisive and inept. Even the well-meaning government policies don’t get implemented, merely because the bureaucracy views them differently. And yet it remains all-powerful and domineering. No wonder, it has earned an unfortunate reputation of being a stumbling block in the way of the nation’s progress. Since a bureaucrat is seldom punished for his acts of omission and commission, indecision or inaction, he feels all the more above board. The upward mobility, despite all this, is rarely affected. This speaks for their appraisal system. That is how the entire system of recruitment, training and appraisal has come under the scanner. Not surprisingly, the government’s proposal for early recruitment at the 10+2 stage on the pattern of the National Defence Academy, as also Ecole Nationale d’Administration of France has come under severe criticism from the bureaucracy. Change is invariably resented. And in this case it is all the more so because the reforms place a heavy premium on efficiency, decisiveness and accountability, besides requiring the bureaucracy to function in keeping with the people-friendly ethos to which it has not been used to. Notwithstanding all this, such criticism does not augur well since the success of these reforms depends largely upon the bureaucracy. Without its cooperation, the current move can go the way of earlier reform attempts and gather dust in the vaults of the Cabinet Secretariat. Now that there is a genuine political will to reform the system, what is actually needed is to encourage a constructive and participative debate to throw up viable options. And it is in that vein that I as an outsider have ventured to air my views on the issue. The aim is to pick up the best brains that the country offers. In fact, it is the age at the entry level that requires some reflection. By this time, a person has a personality of his own, a fixed mindset and moral/value criteria that may not necessarily be compatible with what is needed of him in the service. He has preconceived ideas and enters the bureaucratic arena to realise his own vision. Let me at this stage explain briefly the system followed for recruitment to the officer cadre in the armed forces. The UPSC, through an all-India examination, selects candidates after 10+2. Those who clear are sent for further selection at the Army, Navy and Air Force selection boards where they are appraised for their attributes specific to their opted service. At the National Defence Academy they undergo an intense training under the close supervision of civilian and service officers with major emphasis on academics during the first two years and service training during the third year. They pass out with BA/B.Sc degrees from Jawaharlal Nehru University and proceed direct to the respective Army, Navy and Air Force academies for exclusive-type training for another two years before being commissioned. A point to note here is that those who do not meet the laid-down academic or the core value criteria are continuously weeded out at the end of each semester. The value system has a premier place in the NDA curriculum. Any cadet with doubtful integrity and officer-like qualities, among others, is not tolerated at all. Even after commissioning, the officers continue to undergo training in preparation for higher assignments and are appraised for their performance as well as the moral values practised by them. The weeding-out also continues at each stage of their career and promotion. A similar system with appropriate modifications can, perhaps, be worked out in regard to the selection and training of civil servants also. At a young age a person can be suitably moulded to meet the specified criteria. The professional syllabus and the core value system can be adequately worked out in such a manner that thorough-bred civil servants pass out of the academy. The trainees failing to meet either of the criteria must be weeded out in order to ensure quality. In fact, recruitment and training are one part of the problem which alone cannot cure all the systemic ills that have crept in the system over a period. The political interference has increased to the extent that loyalty, links and caste clout have all become paramount. For fear of retribution at the hands of the ruling politicians, the civil servant is not comfortable in speaking out his mind. Those who stand up in all sincerity get threatened with transfers to odd jobs. Dangling of carrot for lucrative assignments during and even after retirement is yet another unethical but purpose-serving weapon in the hands of the politicians. No wonder, the civil servant has learnt to abide by the wishes of his boss. Paradoxically, the same politician who manipulates the bureaucrat also depends upon him for discharging his ministerial functions effectively, for he is often unlettered and ill-equipped for the job. Thus, the two have started living in harmony and collusion with one another. It is because of this nexus that inefficiency, indecision and rampant corruption have crept in the system, tarnishing the fair name of the bureaucracy. Unless adequate reforms are brought in to overcome this malaise of political overlordism and patronage, no big purpose can be served. The only way to preclude all this is to ensure effective and firm personnel management at the level of the Centre that should brook no interference from any quarter, including the states. Sadly but true, the bureaucracy still remains in the Raj mould: officious, unapproachable and intimidating. It tends to obstruct rather than facilitate progress. Even the foreigners who have to interact with it carry the same impression. In this age of liberalisation and globalisation, the bureaucracy has failed to rise to the occasion. The steel frame is indeed rusted and in urgent need of being rescued. It is no more a question of law and order maintenance or, for that matter, revenue administration. The civil servant is now required to come to grips with the socio-economic and socio-political environment. He has to be trained both initially and later in his career in areas like finance, business management, industrial relations, constitutional and international law, etc. The only way to restore the elan of yore is to infuse a new life into the bureaucracy by reforming the ills that have crept into the system. The bureaucracy is an instrument through which the political hierarchy administers the nation. There should be no dithering; it should either be reformed or replaced suitably. Many a model is available in the world. When we were kids, it was a great occasion to go to see Ram Lila. It would be performed by various groups in different parts of the city over nine days. On the 10th day it would be the Dasehra when Ram and Lakshman would overpower Ravan. The battle was shown by shooting of arrows between them. My maternal grandfather, Lala Sitaram Vohra, was the President of the Arya Samaj, Model Town, Lahore. One full row of seats was reserved for his children and grandchildren to watch the Ram Lila. He used to give a good amount of donation for the performance. We children would have our meals at seven as the performance would start at 7.30 sharp. My grandmother would call all of us, including my uncles and aunts, to come in a queue and put dry fruits in our pockets of whatever dress we were wearing. I was wearing long stocking, frock and a coat, which would reach up to my knee. When it was my turn for the dry fruit to be given she put two handfuls but my pocket would not fill up. Then she put one more and said, “tera te khisa bharda hi nahi”. It was then found that the lining of my pocket was torn and the dry fruit went right down to the hem of my coat. We hurriedly went to the site where there were rows and rows of chairs. Some carried light blankets to cover their legs. The curtains was pulled and the first scene started with Sita’s “Swayamvar”. Dashrath and his three queens, Kaushalya, Sumitra and Kaikayee, were sitting beside him along with Ram, Lakshman and Bharat. On the other side King Janak with his queen and Sita were sitting. Sita looked ill at ease. She was wearing a red sari with broad golden border. Her face was in “ghunghat”. “She” looked taller than Janak. It was time for Sita to get up and go to the centre of the stage where Ram was standing with a garland of red roses and jasmine flowers to put it round her neck. She pulled her “ghunghat” lower and got up to go but was walking with a limp and was stooping. Someone from within the sidescreen prompted, “walk straight”, but Sita continued to walk like that. Then someone from the audience said, “Oh she is taller than Ram.” Just then “Sita” turned her face towards the audience. Her ghunghat came off from her head and revealed a thin moustached face of Naresh Hoon. Everybody started laughing. Naresh had played the role of “Sita” the previous year when he was 16 and there was no moustache at that time. The organisers thought that he was the best person as he would not need much practice and he would memorise the lines easily. They did not realise that he had suddenly also shot up in height. Anyway Ram Lila ended with a thunderous applause from the audience. We all enjoyed it and came home happy and tired. It highlights that India is now in a position to go for new categories reactors not developed elsewhere in the world. That will make the Indian nuclear energy programme unique. When that development takes place, not only the present sanctions against India by the nuclear suppliers group would become ineffective but India would be in a position to go ahead with its own indigenously developed reactors — fast breeder reactor and advanced heavy water reactor and thorium fuel cycle. Mr Sabharwal has vividly described the long and arduous struggle of the Indian nuclear establishment against the sustained attempts of the Western industrialised nations to deny technology to this country and the success of the atomic energy establishments in overcoming those enormous hurdles over the last 40 years. He has brought out the outstanding contributions to the developments of science and technology in general — not merely nuclear — in the country by successive Chairmen of the Atomic Energy Commissions from Dr Homi Bhabha to Dr Anil Kakodkar. He has included in the book a previously unpublished interview with Dr Sarabhai to bring out that contrary to the popular impression Dr Sarabhai was not a nuclear dove (not by 1970) and was for development of underground nuclear explosions. I had earlier vouched for it (it is mentioned in Perkovich’s book) since Dr Sarabhai told me just a few months before his untimely death that he would be going to watch the French tests at Mururoa Atoll in early 1972. Mr Sabharwal deserves particular credit for his chapter “World takes note of India’s nuclear quest” in which he has dealt with the controversies tendentiously generated by certain Western observers and some Indian anti-nuclear lobbyists about the yields of Indian nuclear tests, especially the thermo nuclear device. However, it is quite obvious that his knowledge about India’s nuclear weapon development policy, nuclear strategy and Pakistan’s nuclear development does not match up with the depth of his understanding about the AEC’s development programmes. For instance, as the convener of the National Security Advisory Board, which drafted the draft Indian nuclear doctrine (which has been by and large adopted by the NDA government in January 2003), I can assert that Brajesh Mishra had nothing to do with the doctrine till it was delivered to him. Except to assert a core principle that command and control will be with the civilian authority, the doctrine does not deal with the command and control amateurishly as he alleges. There was no clash on the nuclear doctrine between Brajesh Mishra and Jaswant Singh. Presumably, the author did not come across the Kargil report, which has a chapter on India’s nuclear weapon programme based on evidence given before the committee by R. Venkatraman, P.V. Narasimha Rao and Inder Gujral, besides Dr Abdul Kalam, Dr Arunachalam and others. It brings out from 1983 onwards India was attempting to test nuclear weapons and the Indian nuclear deterrent came into being in 1990. It also brings out that civil servants were not involved in nuclear weapon policy and decisions were made only by the Prime Ministers, the Chairman, AEC, (except at the time of Mr M.R. Srinivasan, who was not in the decision making loop) and the Director of Defence Research and Development Organisation. While the author has brought out the role of Dr A.Q. Khan in the development of centrifuge technology at Kahuta, he has totally underplayed the Chinese role in Pakistan’s weapon development. The Pakistani weapon design came from China. It was China’s fourth nuclear weapon design. Enriched uranium in quantities, tritium for trigger and 5000 ring magnets and M-9, M-11 missiles all came from China. While the author is correct about clandestine Western European nuclear technology transfer through A.Q. Khan to Pakistan, the European centrifuge technology went to China via Pakistan and further developed there. 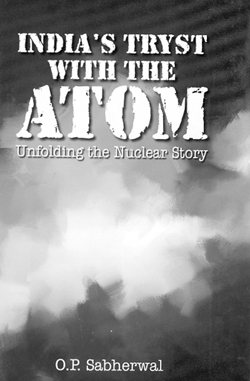 Reading the book one would get the impression that everything within the Atomic Energy Department was hunky dory and there were no strains in the relationships between the Chairman and the Prime Minister. He has made no reference to the Sarabhai period when there was misunderstanding between him and the Trombay scientists. The Indian nuclear strategic policy had very little inputs from the nuclear scientists though they were all in favour of deterrence and for development of weapons. It is to their credit that they were apolitical and disciplined and carried out the Prime Minister’s directives in regard to weapon development. They did not constitute themselves into a powerful weapons lobby. The Prime Ministers kept the strategic policy as their private preserve and did not share it with their colleagues. The result was when the Shakti tests were conducted, credit was not given to the previous Prime Ministers and many Congressmen opposed the tests, though most of the weapon development was carried out by the Congress Prime Ministers. Only the decision to test was that of Vajpayee. The book does not mention the crucial role of Brajesh Mishra in the decision to test. In spite of all its shortcomings on the strategic side, the book is invaluable for its account of nuclear energy development in India. Jawaharlal Nehru described Bhakra as a new temple of resurgent India. More than three lakh visitors visit this man-made monument every year. It will not be out of place to mention here that whosoever visits the Anandpur Sahib gurdwara and Naina Devi Temple for prayers invariably visits Bhakra to pay respect to this engineering marvel. Nehru was a man of vision and foresight. He was the driving force for the construction of this gigantic project, which was the first of its kind after Independence. The keen interest taken by the then Prime Minister is evident from the fact that he visited the project at least 13 times during its construction. He had so much affection and attachment with this project that whenever his close associates or foreign dignitaries visited India, he brought them to the project to show that India was progressing economically. The prominent visitors included Nikita Khrushchev (USSR), Marshall Tito of Yugoslavia, Ho. Chi Minh (Vietnam), Gamal Abdul Nasser (Egypt), Chow En Lai from China and the Dalai Lama. The Bhakra Dam is not only a hydro project but is also a university of learning and technical excellence. It produced a skilled manpower of about 13,000 workmen, 300 engineers during the course of its construction. This highly trained band of workers and engineers further constructed Beas Dam Project, Beas Sutlej Link and also Ranjit Sagar Dam Project using entirely the state-of-the-art technology and indigenous resources. The Bhakra Dam is also a model project for new generation projects like Ranjit Sagar Dam, Tehri Dam, Narmada, etc as their engineers visit here to understand the operation and maintenance system and also draw inspiration and motivation. It is rather a pilgrimage for hydro engineers and others who visit these projects from time to time. The Nangal Hydel Channel, which is a part of the Bhakra-Nangal complex, has been running successfully for the last 50 years, celebrating its golden jubilee on July 8, 2004. The 61-km-long Nangal Hydel Channel has been functioning without any shutdown for the last five decades, which is a tribute to the workers and engineers who have been associated with it. Although Bhakra is now four decades old, yet it continues to bless the people of northern India with prosperity and well-being due to its multiple stream of benefits. Bhakra is having its 41st dedication day anniversary on October 22, 2004. Let us salute the 150 martyrs of the project who laid down their blood and soul for completing the dam. Let us also pledge to maintain the glory of this monument. The writer is the Chief Engineer, BBMB, Talwara township. I am always content with what happens; for I know that what God chooses is better than what I choose. A Divine Incarnation is hard to comprehend. It is the play of the Infinite on the finite. the spirit rejoices over what it has found. You will not be delivered, O man, without cherishing love for God.